What you're looking at is probably the most overbuilt answer to the centuries-old problem of 'I want to build a skyscraper, but there's a pesky protected building on the plot already'. BOBO, a project designed by New York architecture firm SOMA, was originally meant to replace some abandoned shops and an old 1920s house on the edge of downtown Beirut. . But at some point, they realised that the house was a protected building, and had to stay. The result? 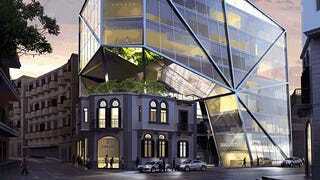 A cantilevered skyscraper that towers over the old building, which will now house high-end retail and an art gallery.